Abu Dhabi, one of the seven states of the United Arab Emirates, has announced a massive, $15-billion, green programme which would make the emirate a major hub for cleantech manufacturing, production and research and renewable energy, says a report on Cleantech.com. The Abu Dhabi government announced the heavy capital commitment at the three-day conference of the World Future Energy Summit held in the city recently. A large chunk of the $15 billion will go toward projects within the emirate only. The state has in fact started moving towards cleantech and hi-tech. The Abu Dhabi-based, $250-million, Masdar Clean Tech Fund - made-up of commitments from the Abu Dhabi Future Energy Company, Consensus Business Group, Credit Suisse and Siemens AG - recently co-invested in NanoGram Inc., a solar technology company. The European Commission has officially unveiled its much-anticipated (and much-leaked) energy package, containing cross-continental proposals on how to reach the targets agreed last year. The headline figures are to cut CO2 emissions by at least 20% by 2020 (rising to 30% if global targets can be agreed), and to source 20% of energy supply from renewable generation. The primary mechanism is the extension of the EU Emissions Trading System (ETS). The first phase of this programme was a less than spectacular success, with too many permits doled out by compliant national governments to favoured power generators. The extended scheme, beginning in 2013, will include full auctioning of permits to the power sector which (economists say) will help maintain a realistic price and thus achieve genuine emission reductions. Auctions will be phased in for other sectors including refineries and aviation. Revenues from the permit auctions will partly go towards supporting innovation in renewables, carbon capture and storage, and other relevant R&D, managed and distributed on a national basis. As pan-European revenues from the ETS are projected to reach up to Euro50bn a year, this clearly has the potential to give the European cleantech industry a huge funding boost. The ETS will also be extended to cover greenhouse gases other than CO2 and involve all major industrial emitters. Year-on-year reductions will aim to reduce total emissions under the scheme by 21% from 2005 levels. Net emission reductions of 10% are meanwhile mandated for industries not covered by the ETS, including buildings, transport, agriculture and waste. National targets vary, depending on the state of economic development, with rich countries facing tougher targets - the UK has a legally binding 16% target while Poland, for instance, is allowed an increase of up to 14% in non-ETS emissions. The binding target for the share of renewables in energy supply also varies depending on national circumstance - the UK has a 15% target, while Sweden aims for 49%. Trading between nations is allowed - and nuclear doesn't count. Controversially, the overall renewables target also includes a 10% biofuels target in each member state. The UK Environmental Audit Committee this week called for a moratorium on increasing the biofuel allocation until robust sustainability standards can be put in place. Most crop-based biofuels will have a tough time proving their sustainable credentials - cellulosic and algal fuels have a much stronger case, but are as yet some way from commercialisation. Another potentially valuable step is that state aid for renewable power generation schemes will now be allowed, so long as it just covers the difference between production costs and market prices. That should help any national government which wants to boost its renewables industry. It's a decent enough set of proposals, offering plenty of opportunities for cleantech companies. It's questionable whether the targets are tough enough - the stated aim is to cap the mean global temperature increase at 2°C. According to the latest science, that's probably rather naive. But the main thing now is to get the international mechanisms in place, and to develop the cleantech industries, that will allow further necessary reductions to be achieved. This post is a divulgation of the TerraChoice study: The “Six Sins of GreenwashingTM” - A Study of Environmental Claims in North American Consumer Markets. The recent surge of environmental awareness in North America is unmistakable. It has been documented by many researchers and widely reported in the popular press. The rise in “green” marketing claims has also been well documented. Less studied is the apparent increase in “greenwashing” – false or misleading green marketing claims. In an effort to describe, understand, and quantify the growth of greenwashing, TerraChoice Environmental Marketing Inc. conducted a survey of six category-leading big box stores. Through these surveys, 1,018 consumer products were identified bearing 1,753 environmental claims. Of the 1,018 products examined, all but one made claims that are demonstrably false or that risk misleading intended audiences. Based on the survey results, six patterns were identified in the greenwashing, which are recognized in this study as the “Six Sins of GreenwashingTM”. Can MLK's Dream Be Reborn in the Economic Stimulus Package? When Dr. Martin Luther King Jr. was assassinated forty years ago in Memphis, he was calling for a campaign that would unite the poor and working classes of all races behind a shared economic future. Today, with ever increasing income gaps, rising oil prices, rapid climate change, expanding outsourcing, and economic instability, Dr. King's dream is as necessary as ever. As we honor King's life and vision tomorrow, it's time for his dream to be reborn, not only to meet the still-lingering challenges from his time but also the unique challenges of ours. Today, as Congress prepares a giant Economic Stimulus Package, there is no better way to honor Dr. King’s memory and continue his struggle than to demand that Congress go green and go equal in the stimulus. The economic stimulus package could simply go towards short-term consumer spending that may temporarily prop up our economy, or it could help lay the foundation of prolonged economic prosperity. We could invest in new iPhones or in a sustainable, just, and prosperous energy future. It's up to Congress now to decide which. While crafting a national stimulus package, Congress should develop policy measures that not only help keep our economy out of recession in the short-term, but also make smart investments in longer-term, sustained economic prosperity by moving our nation towards a clean energy economy that provides employment opportunities for all Americans. In addressing America's current economic difficulties, we have a unique opportunity to not only avoid a recession, but also to address one of the root causes of our current economic woes: high energy prices and our dependence on dirty and depleting fossil fuels. We have an opportunity to act boldly to strengthen American energy independence, invest in the clean, sustainable energy sources that will form the foundation of a new era of economic prosperity, and take aim at global warming - all while putting hundreds of thousands of Americans to work. By increasing national energy efficiency, reducing out-of-pocket energy spending, and creating employment opportunities, the measures above will meet basic stimulus goals while furthering national objectives of climate protection, energy security, and economic equity. This year's stimulus package offers the unique opportunity to advance all these aims, and we encourage you to seize it. A new clean energy economy must provide equal opportunity and equal protection for all. Dr. King was working towards this dream when he was killed. Let us come together now to continue his unfinished work and create a more sustainable, just, and prosperous America. Help spread the word and put pressure on Congress to focus on solutions to the recession that also achieve longer-term economic prosperity, equal opportunity and a sustainable energy economy. Let the Dream be Reborn! It's finally happened: $100-per-barrel oil is no longer some looming specter, just a dark possibility used by Peak Oilers to frighten little chillun's into driving less. 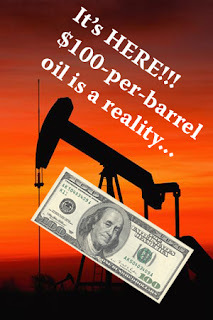 As we welcome in 2008, the specter of $100 oil has gone from pernicious possibility to fact-of-life reality as oil prices touched $100 per barrel today on NYMEX. Of course, oil prices didn't stay at $100 for long before the fell back into the "comfortable" $90s. But consider this: when this blog started in summer 2005, oil prices were trading around $55 dollars, already up about 100% from the $20-30 price range oil hovered at between 2000-2004. 2006 started with oil prices trading around $60/barrel and by the beginning of 2007, prices had topped $75 before falling back down to around $60 to welcome in the new year. Of course, the brief fall in prices would be just that - brief - and oil prices climbed steadily in 2007, inching towards record-setting heights seemingly every day. On October 19th, 2007, oil prices topped the $90-per-barrel mark for the first time in history before falling back into the $80s. Crude oil prices jumped by 28 percent just between August and October 2007. By year's end, $90-per-barrel oil seemed pretty normal and it was only a matter of time before the $100 threshold was breeched. Well, today, our time is up as oil hit exactly $100.00/barrel today on NYMEX before receding into the high $90s. $100/barrel is clearly a record in nominal prices, but it's also pretty close to - if not exceeding - the inflation-adjusted record price as well. Depending on the adjustment, $38 barrel of oil in 1980, the previous inflation-adjusted record price, would be worth somewhere between $96 to $101 in today's dollars. We're entering uncharted territory in oil prices now. Anyone want to wager on where oil prices will be by the end of 2008? If so, place your bets in the comments section here (and for a more lucrative prize: a bottle of champagne to the victor I believe, check out this running contest at Jerome a Paris' DailyKos dairy).